God Comes; - And Who Shall Stand Before His Fear? 1. God comes; — and who shall stand before His fear? Who bide His Presence, when He draweth near? To kneel before Him there! All bare and naked lies. 4. How can I bear Thy fearful anger, Lord? I, that so often have transgressed Thy word? And spare me in that day. The Bridegroom close the door! 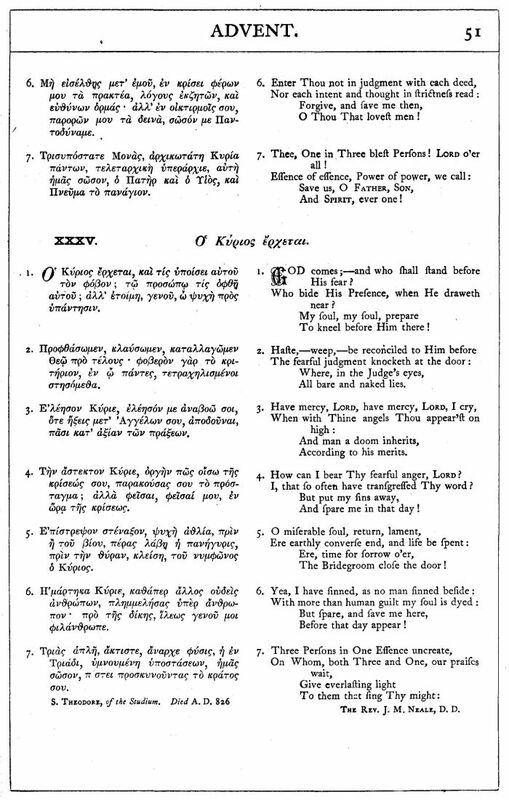 Scan of Greek and English Translation from J. H. Hopkins, ed., Great Hymns of the Church Compiled by the Late Right Reverend John Freeman Young (New York: James Pott & Company, 1887), #35, p. 51. 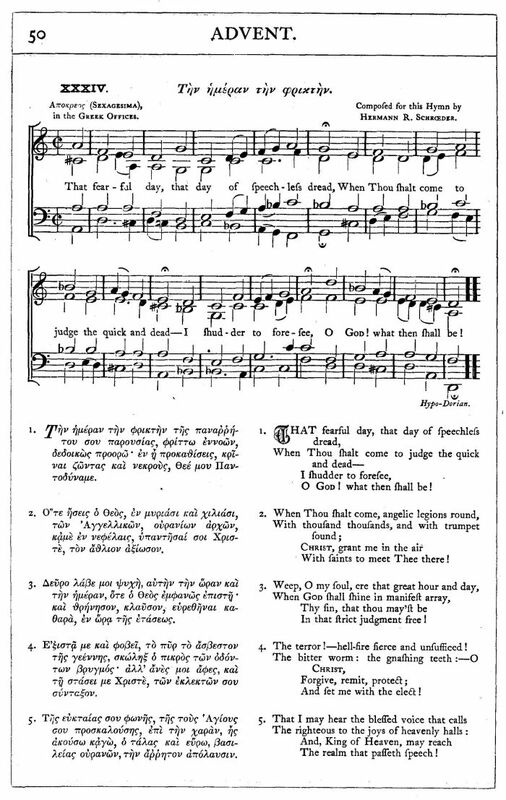 Sheet Music to "That Fearful Day, That Day of Speechless Dread" from J. H. Hopkins, ed., Great Hymns of the Church Compiled by the Late Right Reverend John Freeman Young (New York: James Pott & Company, 1887), #34, pp. 50-51. J. H. Hopkins, ed., Great Hymns of the Church Compiled by the Late Right Reverend John Freeman Young (New York: James Pott & Company, 1887), #34, pp. 50-51. Bernard Pick, ed., Hymns and Poetry of the Eastern Church (New York: Eaton & Mains, 1908), pp. 147-148. Ode I. That Fearful Day, That Day Of Speechless Dread - Τήν ήμέραν τήν φρικτήν. Ode III. God Comes; - And Who Shall Stand Before His Fear? - Ο Κυριος ερχεται. Ode IV. The Day Is Near, The Judgment Is At Hand - εφεστηκεν η ημερα. Ode IX. The Lord Draws Nigh - Ο Κυριος ερχεται. These odes, renumbered 1 to 4, were reprinted in Bernard Pick, Hymns and Poetry of the Eastern Church (New York: Eaton & Mains, 1908). The first two were also reprinted in J. H. Hopkins, ed., Great Hymns of the Church Compiled by the Late Right Reverend John Freeman Young (New York: James Pott & Company, 1887). “ON THIS DAY, WE COMMEMORATE THE SECOND AND IMPARTIAL COMING of our LORD JESUS CHRIST. This commemoration the most Divine Fathers set after the “two parables” (i.e., the Gospels of the two preceding Sundays, The Pharisee and Publican, and the Prodigal Son) “lest any one, learning from them the mercy of GOD, should live carelessly, and say, ‘God is merciful, and whenever I wish to relinquish sin, it will be in my power to accomplish my purpose.’ They therefore here commemorated that fearful day, that, by the consideration of death, and the expectation of the dreadful things that shall hereafter be, they might terrify men of negligent life, and bring them back again to virtue, and might teach them not simply to put confidence in GOD’s mercy, considered by itself, but to remember also that the judge is just, and will render to every man according to his works.” As the Eastern Church has no such season as Advent, this commemoration becomes more peculiarly appropriate. The Canon that follows is unfortunate in provoking a comparison with the unapproachable majesty of the Dies Irae. Yet during the four hundred years by which it anticipated that sequence, it was undoubtedly the grandest judgment-hymn of the Church. Its faults are those of most of the class: it eddies round and round the subject, without making way,—its different portions have no very close connexion with each other,—and its length is accompanied by considerable tautology. Yet, in spite of these defects, it is impossible to deny that the great common-places of Death and judgment are very nobly set forth in this poem. On account of its length, I give the first three and last Odes only. Theodore of the Studium (a celebrated convent near Constantinople) is distinguished for his sufferings in the iconoclastic controversy, and died in exile, November 11, 826. Theodore of the Studium, by his sufferings and his influence, did more, perhaps, in the cause of Icons than any other man. His uncle, S. Plato, and himself, had been cruelly persecuted by Constantine, for refusing to communicate with him after his illicit marriage with Theodora, at a time when, as we have seen, the firmness of even the Patriarch Tarasius gave way. Raised subsequently to be Hegumen of the great abbey of the Studium, the first at Constantinople, and probably the most influential that ever existed in the world, Theodore exhibited more doubtful conduct in the schism which regarded the readmission to communion of Joseph, the priest who had give the nuptial benediction to Constantine: but he suffered imprisonment on this account with the greatest firmness. When the Iconoclastic persecution again broke out under Leo the Armenian, Theodore was one of the first sufferers: he was exiled, imprisoned, scourged, and left for dead. Under Michael Curopalata he enjoyed greater liberty; but he died in banishment, Nov. 11th, A.D. 826. His Hymns are, in my judgment, superior to those of S. Theophanes,—and nearly, if not quite, equal to the works of S. Cosmas. In those (comparatively few) which he has left for the Festivals of Saints, he does not appear to advantage: it is in his Lent Canons in the Triodion, that his great excellency lies. The contrast there presented between the rigid, unbending, unyielding character of the man in his outward history, and the fervent gush of penitence and love which his inward life, as revealed by these compositions, manifests, is very striking;—it forms a remarkable parallel to the characters of S. Gregory VII., Innocent III., and other holy men of the Western Church, whom the world, judging from a superficial view of their characters, has branded with unbending haughtiness, and the merest formality in religion, while their most secret writings show them to have been clinging to the Cross in an ecstasy of love and sorrow.